A big selling point with Intergas boilers is that they offer a degree of flexibility in their installation making it possible to install the hot water system first and connect the central heating system later, so any potential inconvenience of a boiler change, i.e. having no access to hot water, is kept to a minimum. In addition, due to the unique design of the Intergas heat exchanger, you will still have hot water even if the pump fails. Intergas is also one of the most competitively priced brands on the market. If you’d like to find out exactly how much a new Intergas boiler is likely to cost you, send us an enquiry today for up to 3 free, no-obligation quotes. Combi boilers, as the name suggests, combine both a water heating system and central heating in one compact unit. The benefit is that there is no separate cylinder needed to store the water so it’s particularly handy if you’re short on space. It heats the water as you need it so you are not spending energy on maintaining a constant tank of hot water. Intergas offer two Combi boilers: the Combi Compact HRE and the Combi Eco RF. The Combi Compact HRE and ECO RF come standard with an RF module for use with the Intergas intouch app. With an internet connection you can retain control of your central heating from your smartphone even when you are not at home. Compatible with Honeywell wireless room thermostats T87RF1003 Round RF, the DTS92 and CMS927. The Combi Compact HRE demonstrates Intergas’ revolutionary condensing boiler technology: Double High Efficiency. The Intergas Combi Compact HRE is available with four power outputs (24/18, 28/24, 36/30, 36/40). All Intergas HRE boilers are Energy Saving Trust recommended with an efficiency rating of up to 95.8% for domestic hot water. 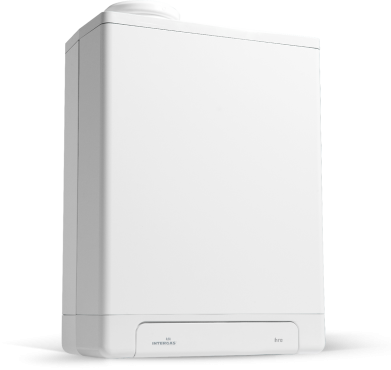 The Combi Compact ECO RF is the result of over twenty years of Intergas’ pursuit of High Efficiency boilers. The success of the Combi Compact ECO RF’s design has been acknowledged by the Dutch consumer association and has been awarded the “Best Tested” accolade for two years running. The ECO RF is available in three outputs: 24, 30, 36. When the Intouch app is used in conjunction with the ECO RF, it can boost the efficiency of the boiler even further as it works with the Honeywell Round OpenTherm thermostat, improving communication with the boiler. This results in less energy usage as it responds to varying demand. The Intergas Rapid combi boiler combines high efficiency in both hot water and central heating modes. It retains all the benefits of Intergas’ revolutionary condensing boiler technology. It’s available in two power outputs, 25kW and 32kW. All components are easily accessible as the boiler case is removed from the front and, with the built-in expansion vessel, there is no need to use a jig. Intergas provides a 3 year warranty on labour and parts. The Intergas Rapid is a 4 in 1 boiler that can also be easily converted into system, open vent or multi-point by changing parameter settings in the software. There are just 12 components, including 4 moving parts, which means less maintenance, lower service costs and greater reliability. Intergas are a great value choice for your combi boiler, especially if carbon emissions is high on your priority list, but it’s still important to get at least three comparative quotes from experienced and highly rated installers. Send us an enquiry and we will put you in touch with three of the best quality installers in your area for a no obligation quote. Get quotes for a new Intergas boiler. The Intergas Compact HRE System Boiler is a central heating-only boiler. It works with standard ‘on/off’ thermostats but also with programmable room thermostats. The built-in frost thermostat protects against cold-weather damage and, by adding a hot water storage cylinder, the boiler can heat hot water in addition to the radiators. The Intergas System boiler is available in four outputs: 18, 24, 30, 40. The Intergas System boiler is central heating only so if you’re looking for a solution to include your hot water you will need to purchase a storage cylinder in addition. This will add to the cost and the complexity of the installation so it’s really important to be confident you’re getting the best possible service. We recommend comparing quotes from at least three different suppliers. Get quotes for a new Intergas boiler. The Intergas Compact HRE OV open vent boiler is a central heating-only boiler for use in an open vented system with a header tank. If you’re simply looking to update an older, traditional system this boiler is ideal. The constantly modulating fan automatically adjusts the capacity of the boiler to your requirements, conserving valuable energy. If you need your boiler to provide hot water too, a storage cylinder can also be added. As with the Intergas System boiler the Regular boiler is for central heating only. If you need an integrated hot water supply you will need to purchase a storage cylinder. We can put you in touch with up to three reputable and experienced suppliers in your area to guide you through the best options. Get quotes for a new Intergas boiler. It’s important to keep your boiler in the best possible condition with an annual boiler service by a professional engineer. This will ensure the boiler can operate as efficiently as possible, keeping heating bills to a minimum, and that there are no potential safety issues to be concerned about. A boiler service is also a great way to catch and fix small repairs before they have the chance to worsen over time and cause an expensive breakdown. Find out what’s involved in an annual boiler service, why it’s so important, the benefits and how much they cost in Intergas Boiler Service. Every boiler manufacturer offers a standard warranty with their boilers which last between 1-10 years. The warranty is your insurance policy and means if a fault develops the manufacturer will resolve it within a specified time frame. Some warranties include both parts and labour while others may only cover parts. The most important thing to remember is to get your boiler serviced by a Gas Safe registered engineer every year as failing to do so is likely to invalidate your warranty. For more detail about this brand’s warranty (including the small print) take a look at Intergas Boiler Warranty. Even the highest quality boiler can develop faults and problems as they age. Some are minor issues you may be able to handle yourself but most will need a Gas Safe registered engineer to diagnose and repair the problem. To find out if there are any common problems associated with this manufacturer you can read our guide to Intergas Boiler Repairs & Common Intergas Boiler Problems. Error codes may appear on your boiler’s display; it’s your boiler’s way of telling you that something is wrong. Each manufacturer uses a different coding system to help an engineer to diagnose a fault. In some cases it may be a simple issue such as low pressure which you can adjust yourself but more technical faults will certainly need a professional. We’ve put together a list of error codes for all Intergas Boilers to help you understand what’s wrong before you contact an engineer. Intergas Comfort Touch system is an intuitive wall mounted room thermostat with a touchscreen display. All Intergas boilers manufactured from 2017 are compatible with the Comfort Touch thermostat. The Comfort Touch app enables you to control the thermostat from your smart device.